Claimed off of waivers by the Red Sox last week, Juan Francisco has been receiving regular playing time for Tigres del Licey, mainly as a designated hitter. He was 4 for 15 on the week in four starts. He had a big game on Saturday, going 2 for 4 with a home run, double, and a pair of RBI. Aneury Tavarez got one start this week and appeared in two more games as a defensive replacement, finishing 2 for 5. Neither Miguel Celestino nor Heri Quevedo saw game action on the week. 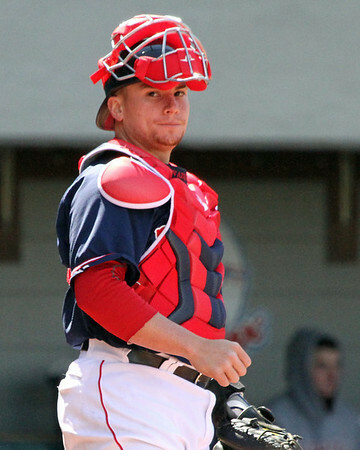 Christian Vazquez (pictured) continues his solid play for San Juan. The catcher was 3 for 12 with a double and a pair of walks and two runs scored, and a .276/.371/.345 line on the year. Henry Ramos was hitless in his three starts, going 0 for 9 but drawing three walks. Dayan Diaz took the loss in his only outing of the week, as Carolina touched him up for two runs on one hit in 1 2/3 innings. He struck out one and walked a pair in the defeat. Per Rob Bradford of WEEI.com, Rusney Casillo will join the Caguas club on December 2. Sergio Gomez has struggled in the early going for Cartagena. The right-hander has appeared in a pair of games, allowing four runs in 5 1/3 innings, striking out four and issuing seven walks. The Red Sox affiliate was 2-3 on the week, dropping to 13-18 on the season. Carlos Garcia turned in a strong start Tuesday, firing five shutout innings, giving up four hits and striking out six without walking a batter. Mario Alcantara was similarly dominant in Sunday's win, striking out five and scattering two hits in five innings. Deiner Lopez had a big week, going 6 for 16 in four starts. He lead the way in Tuesday's win over Navagantes, going 3 for 4 with a walk, RBI, and run scored. William Cuevas was assigned back to the La Guaira team of the Liga Paralela after struggling in a short call-up to La Guaira's main club. He pitched out of their bullpen Wednesday, allowing a run on three hits in two innings, walking and striking out one apiece. Also on the mound for La Guaria was Oscar Perez. The right-hander got credit for the win on Tuesday with two scoreless innings of relief, allowing one hit and striking out one. Recently signed free agents Hanley Ramirez and Pablo Sandoval also typically play winter ball. Neither have appeared in game action yet, as traditionally major league veterans begin later in the winter ball season. If they do play winter ball this year, Ramirez will play for Licey in the Dominican League, while Sandoval would play in the Venezuelan League for Magallanes. Update: Sandoval's contract apparently contains a clause that does not allow him to play in Venezuela during the offseason.